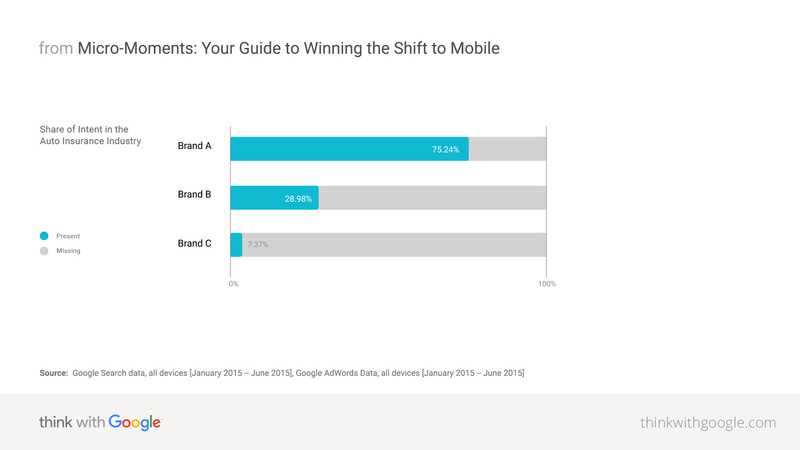 When people turn to their mobile device to get answers or take action, it’s a chance for brands to deliver. Are you there? That simple question can guide your efforts as you embrace the mobile shift. Here’s how to think about identifying micro-moments and evaluating your commitment to being there. Marketers obsess over “being there” for their consumers. Whether it’s share at the store shelf or share of voice on TV, these are metrics used to judge how present a brand actually is. But what about on mobile, where there are billions of micro-moments happening every day? Are you devoting the same amount of thought to your mobile marketing strategy and your brand’s role in being there whenever consumers’ needs arise? When someone picks up their mobile device, chances are they want to learn, do, find, or buy something right now. Whether in the form of searches, app interactions, mobile site visits, or even YouTube video views, these micro-moments happen constantly. Showing up gets your brand in the game to be chosen, not just seen. By being there, your brand has the chance to address consumer needs in the moment, help move someone along their decision journey, and deepen their loyalty. Showing up gets your brand in the game to be chosen, not just seen. Look at how FIAT made a comeback in America by committing to being there for small car researchers. After a 28-year hiatus, automaker FIAT returned to the American market, bringing with it the FIAT 500, a small city car. But after such a long absence, FIAT found it needed to build awareness with a new generation of American consumers. The time was a good one: gas prices were spiraling upwards and Americans' interest in small, efficient city cars was at an all-time high. FIAT saw that its old perceived disadvantages could quickly become strengths. The company deployed online and mobile search ads on category terms like “small car” and “city car” to reach people in those micro-moments of research and interest. In addition, each ad made the most of its context. On desktop, FIAT's ads took people to its online car configurator. (The FIAT 500 was available in a half-million color combinations, and customizing it was part of the fun.) On mobile, the ads pointed people to the nearest dealership, where they could see and buy the car in person. The results were tremendous. FIAT saw a 127% increase in unaided recall. The FIAT 500 became a huge success in America, and even more importantly, the brand was back. Unfortunately many brands are still falling short when it comes to being there for consumers. Take the below examples from two categories (education and auto insurance) which illustrate a broader, cross-industry pattern. In each case, there are lots of category-relevant micro-moments happening in search at any given time, but brands are missing opportunities to engage because they’re not showing up. The charts illustrate what we might call “share of intent”–or how many times a brand was there as a fraction of all category-relevant searches. It’s worth noting that this missed opportunity in the form of low share of intent is happening across devices, but it’s especially true on mobile. 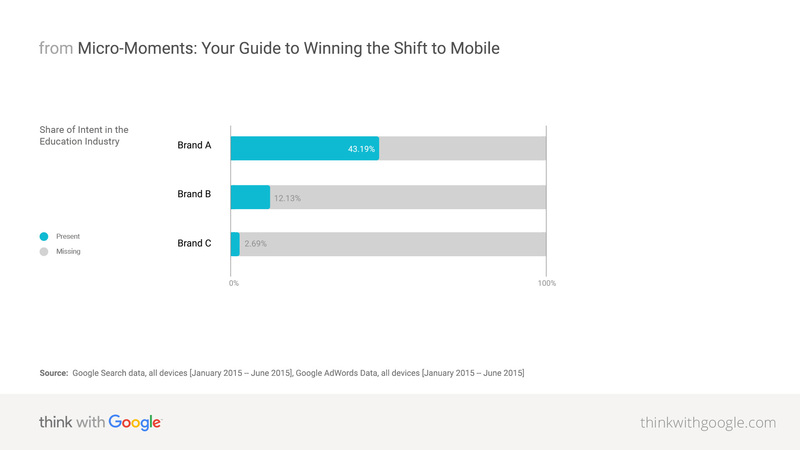 And as consumers continue to lean on mobile, it’s even more imperative to close the presence gap. What happens when you hold the mirror to your own brand? 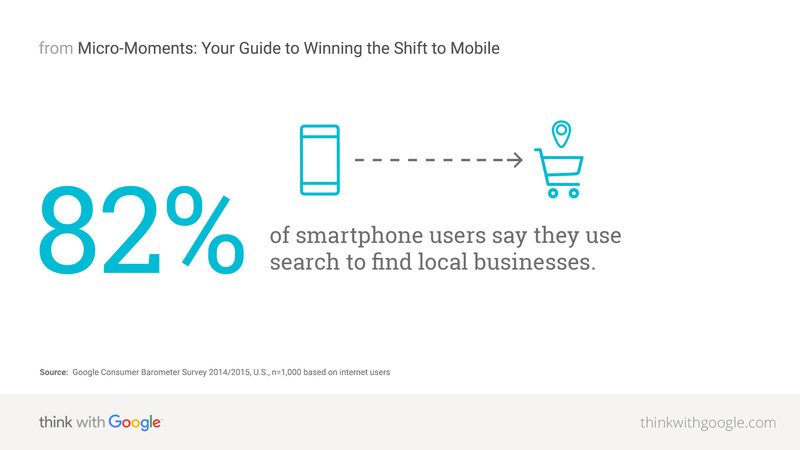 First, grab your mobile device and perform some of the top searches relevant to your business category. Are you there? Do you like what you see? What about when you do the same on YouTube? Prioritize the micro-moments your brand can’t afford to lose. Next, work with your team and your agency to get the “share of intent” metric for your brand. Evaluate that metric for category-relevant searches on both mobile and desktop, and see how you stack up against your key competitors. Chances are you’ll discover some gaps. Create a plan to close those gaps over time by boosting your ad coverage across a greater number of micro-moments and growing your share of intent. When you fail to be there, you’re simply handing opportunities over to your competitors. Nobody wants that (except your competitors). So find those moments when you should be present, and dig in your heels. OK. You’re ready to be there in the micro-moments that matter to your brand, and you’re committed to growing your share of intent, especially on mobile. But how do you get started, since there are millions of potential moments? A good guiding principle is this: be there across all stages of the consumer journey, not just when someone is ready to buy. To accomplish this, consider four key moments types that represent the full range of needs people have. I-want-to-know moments: Someone is exploring or researching, but not yet in purchase mode. They want useful information and maybe even inspiration, not the hard sell. I-want-to-go moments: People are looking for a local business or are considering buying a product at a local store. Being there means getting your physical business in their consideration set in that moment. I-want-to-buy moments: These are huge, of course. Someone is ready to make a purchase and may need help deciding what or how to buy. You can’t assume they’ll seek you out; you have to be there with the right information to seal the deal. I-want-to-do moments: These may come before or after the purchase. Either way, these are “how to” moments when people want help with getting things done or trying something new. Being there with the right content is key. Building a strong “be there” strategy across the four key moment types requires considering two things: a user’s intent and context. Investigating intent will focus you in on more specific consumer needs that you could address within each moment type. Here you want to look into things like top searches, trending searches, and top search questions relevant to your category. Ask yourself again–are you there? Prioritize the micro-moments your brand can’t afford to lose. Next, layer context on top of that intent. In other words, think about how the consumer’s needs might change based on their situation. Does the device, time of day, or location call for a more tailored approach to being there? For example, should you be there differently for I-want-to-go moments during store hours versus after store hours? Should you have a different presence strategy for I-want-to-know moments when someone is inside your bank versus far away? When they’re looking for instructions on a smartphone versus desktop? Considering these intent/context combinations will not only help you identify more specific micro-moments to go after, but they can also encourage ideas for how to be most useful with your presence in your content, ad messages, and app functionality when you are there. For Sephora, finding out more about its consumers’ intent within the in-store context allowed it to be there more meaningfully on mobile. The executive team at beauty retailer Sephora noticed how often its customers searched on their phones while standing in the store aisles. While many retailers fear that customers use mobile to shop competitors, the Sephora team understood the power of mobile and was eager to see how the brand could tap into that mobile behavior in a helpful and meaningful way. The company learned that most of their clients were looking for reviews of the products they had in their hands, or trying to remember which shade of makeup they’d bought last time. With these needs-based insights in hand, Sephora developed mobile website and app functionality specifically to serve shoppers in those moments. Consider the most searched topics for your brand or category. Grab your mobile device and try those searches. Are you there and do you like what you see? Much like share of the store shelf or share of voice on TV, what is the share of consumer intent you’re capturing with your mobile marketing strategy? How big is the gap versus desktop? How big is the gap versus your peer set? Are you only there at the bottom of the funnel, when people are in buying mode? Or are you there across the full range of consumer needs, wants, and curiosities? Are you also considering the various contexts of those needs, and are you adjusting your strategy accordingly?